My 4 year old son Landon went as the "Tin Man" from The Wizard of Oz. I made his costume with poster board, bottle caps and lots of silver spray paint! Hello! 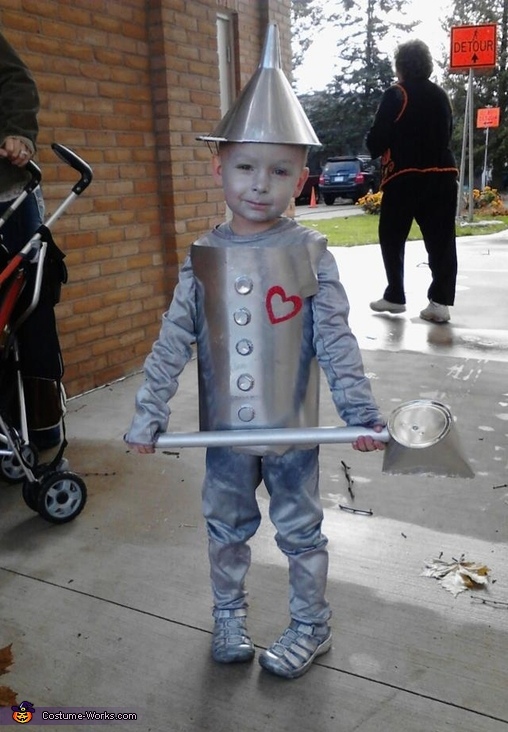 I'm doing a "Wizard of Oz" theme for my family this Halloween and my 6 year old son is going to be tinman and I love how you did this costume. It seems so simple, could you please give me a step to step tutorial on it? Thanks! Ditto Rose Tran's comment (except my son is 5). Would really appreciate the step by step info please. Promise to do my best to do your costume justice. Hi could u give me step by step instructions my 8 year has to dress up for workd book day. Any way to get step by step instructions?? My daughter is in a marching band and her section are to be tin men.Most of them would probably take a medium.I don't know about the other family's but we need a easy and inexpensive tin man. Could you send a tutorial that can be printed and not a lot of pages as I would have to provide for the other 3 girls.